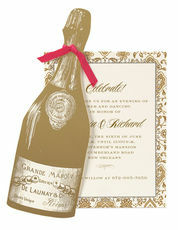 Celebrate your special occasion with this set of invitations featuring a champagne bottle ready to pop. 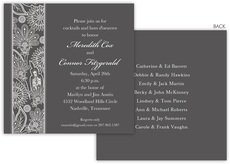 This set of invitations are flat printed with Black ink using your choice of typestyles. Blank.. 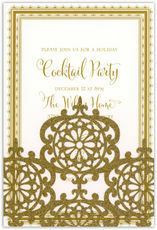 These invitations feature a printed invitation on ivory cards inserted into a gold glittered die-cut pocket. 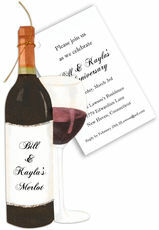 Invitations measure 5.25" x 7.75". 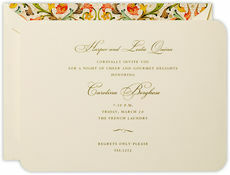 Invitations, envelopes and diecut pockets are sold in a.. 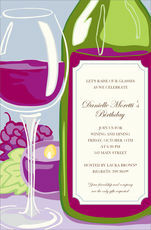 This Invitation is the perfect way to announce your party or special event in style. 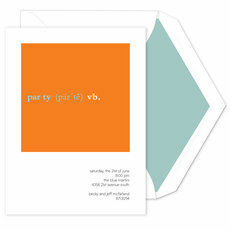 Personalize with your own special text, and use it for the party or event of your choice. Blank white envelopes are.. 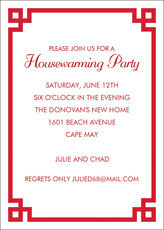 These invitations feature a printed invitations inserted into a die-cut 3-dimensional paper flip flop. Assembled invitations measure 5.25" x 7.75", printed invitation measures 3.25" x..
Ready for a wine and cheese party. 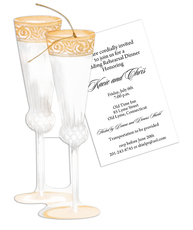 These invitations feature red wine bottle and glass of wine die-cut cards attached to printed invitations on white cards secured with gold cord. Invitations,.. 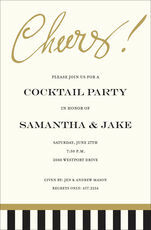 These invitations feature a printed invitation on ivory cards inserted into a shiny gold stripe ribbon die-cut wrap. Invitations measure 7.75" x 5.25", Invitations, envelopes and diecut.. Throwing a cocktail party is a fun way to get together with friends, neighbors and colleagues for a social evening filled with networking opportunities. 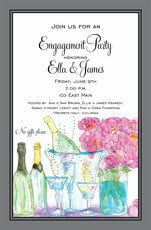 To let everyone know about your upcoming event, you will want to send out some attractive cocktail party invitations. 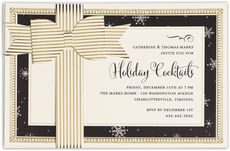 Our cocktail party invitations come in many shapes, including rectangular, die cut and square. 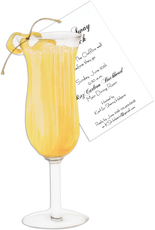 If your cocktail party has a theme, such as for the holidays or someone's birthday, we have styles that include those themes as well. 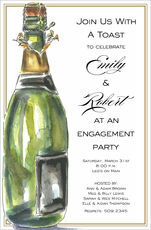 Many of our designs provide you with the opportunity to include a photo on your invitation. 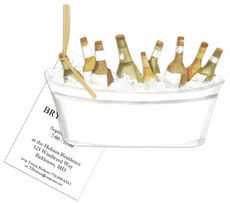 This could be a fun way to showcase your party's guest of honor. 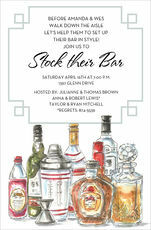 Once you have chosen a style from our many cocktail party invitations, you can start customizing it to make it your own. Select from our hundreds of available typefaces, which include script fonts, fun styles and more traditional printing typefaces. We offer a standard flat black ink, or you could choose something more colorful and fancy in keeping with your cocktail party's overall theme. We can print your return address on the blank envelopes and line them with a coordinating solid or printed interior. 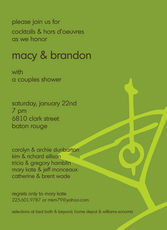 Underneath the images on the cocktail party invitations, you will have enough space to note your event's specifics. 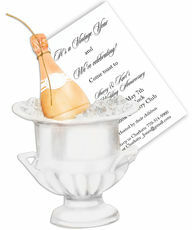 Our designs allow you to state the event's location, date, time and address plus personalize with your own style and flair. 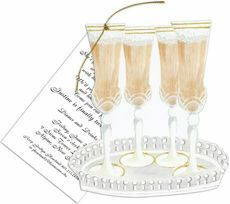 Remember to include the names of the host or hostess and supply Rsvp information so that your guests can reply on time.